Peanut Butter and chocolate lovers are going to LOVE today’s Fabulous Food Find. 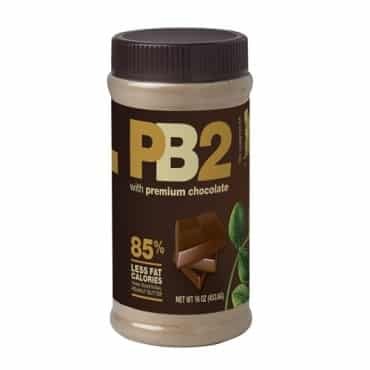 It’s PB2’s new version of powdered peanut butter with premium chocolate for just 1 Point! Now, I know the idea of peanut butter in powdered form may have you raising an eyebrow…I did too…until I tasted it. 2 tablespoons of the powdered mix, combined with water to create a delicious, creamy and decadent chocolate peanut butter blend. Spread it on toast, fruits, veggies…the possibilities are endless. You can use Chocolate PB2 with just about any other form of liquid, like shakes and smoothies, and you can use it in baking or cooking too. It’s incredibly versatile! And at just 1 Point per serving, Chocolate PB2 is a dream come true. PB2 is unlike any other low calorie peanut butter option on the market. Available in regular peanut butter or chocolate peanut butter flavors, PB2 comes in a powdered form that reconstitutes with a liquid. The texture and taste are spot on, and with 85% less calories and fat that regular peanut butter, PB2 is truly a Fabulous Food Find for Weight Watchers. Click here to order it on Amazon! I really love PB2, especially the chocolate flavor. I usually have more than one serving, but 2 or 3 points + for a snack is totally acceptable to me (I usually have it with an apple). Kathy Bickley, have you looked at Target? I get it at my grocery store but a friend told me Target has it as well. Maybe look on their website? Hope you are able to find it. I see there is no place in Ohio that carries it. Is there a web sight to order it? I’ve ordered the regular and the chocolate PB2 from Amazon.com several times. I live in NW Ohio and can get it at Walmart, Anderson’s General Store and occasionally Krogers. Hope that helps! I live in NE Ohio and the Super Walmart, Acme, and Giant Eagles near me carry PB2.